The unicorn knows it is a unicorn, but may hide it from the world. 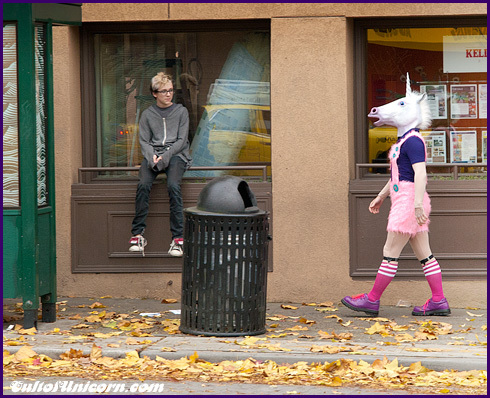 The unicorn rejects the boredom and common things of the average life and strives for more. The mass of humanity runs in herds like horses, seeking the bare necessities of existence like food and water, but the unicorn stands alone and runs toward rainbows. Instead of worrying over base things, the unicorn strives towards dreams that it uses to change the world. 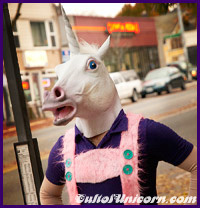 The unicorn uses its weapons of strength, creativity and audacity to instigate change. The unicorn does not use the opinions and desires of others to decide what it should do, it goes by an inner compass defined by taste, decency, intelligence and whimsy. While we do not think that unicorns should join together in herds, we do recognize that there is power in knowing that there are other unicorns out in the world. There is power in knowing that you are not alone. Own that you are a unicorn and a new world will open up to you.